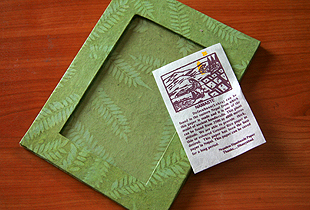 Exquisite handmade lokta paper Photo Frame, handcrafted in Nepal using ecologically sound, traditional techniques which is nearly 2000 years old. Exquisite handmade lokta paper handcrafted in Nepal using ecologically sound, traditional techniques which is nearly 2000 years old. The loktha ( Daphne Cannabina ) tree is a fast growing, under-story shurb, which grows in the middle mountains of Nepal, at 6500 feet in elevation. The bark of lokta tree is pounded to fine pulp and soaked in hot water. This mixture is then diluted and sifted through fine cotton mesh screen, which are dried off. The art of lokta paper is being preserved through various equal opportunity cooperatives which teach and provide income for many Nepalese women and men. Lokta paper is acid free, soft and smooth in texture fibrous in appearance and has exceptional durability. This is why lokta paper is still in use by the Government of Nepal for their official work.